Discussion in 'Forza Motorsport 7' started by neddyie118, Dec 3, 2018. Flashfire926, FoRiZon, klondike and 9 others like this. Oh frick, I actually have a reason to play FM7 now. Maybe this means they'll add the other newer GT race cars now. Vinylshark, ferhound and TypeOne like this. Holy crap, was not expecting the M8 GTE....real nice addition. But still when will or will we ever get newer prototypes..
Really impressed that T10 are committed to improving FM7. UKMikey, Jordanm, GTPVenomZombie and 14 others like this. Holy crap!! FM7 is getting a new main menu update as well!! Also love the new car! This is one of the reason I'm glad T10 are taking the year off, same with PG. This update is getting me hyped up! DSR, dirtyduckuk76, Master Weasel and 1 other person like this. Does anybody remember when they promised another car pack for car pass owners? And it's been 5 months since the last real car pack? Because Pepperidge Farm sure remembers. yabiggoose, AlienDeathRay, RaceFuchs and 2 others like this. They say one thing and then do something else completely. A tiny part of me hopes the M8 has been made comically large like the memes. Lawndart, Cloudy, Dylan and 1 other person like this. Indeed! Makes me glad they didn't abandon FM7, because seeing these updates to make it better is the best! Dsavage27 and vinz7531 like this. Amen to that! I sorta look at this update as a "Spec 2.0" type ordeal. vinz7531 and TokoTurismo like this. in IMSA, BMW teams garnered two wins and finished fourth in the highly competitive GTLM class, proving it as a viable racing platform. Which, for those unaware or not up to date with GTLM and IMSA, is last place*. Nice way to make it look positive, though. Interesting to note it's the presentation model and not the RLL/MTEK car that actually raced IMSA and WEC. *Excluding the Risi Ferrari team that only did 3 races through the season with very little sucess. Still no word on the final car pack, though? Got to be something special. Cloudy, neddyie118 and Dsavage27 like this. Looks like I was right when I predicted December's free car would be a BMW since they added a BMW driver suit to the game in the last update. 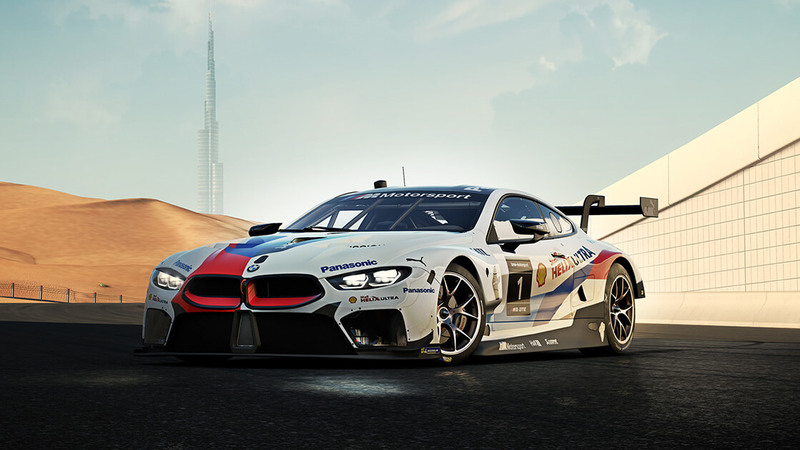 This article was published by Gary Slater (@AudiMan2011) on December 3rd, 2018 in the Forza Motorsport 7 category. I also wonder what's the looooong holdup with this last car pack. I mean it hasn't even been mentioned at all in nearly half a year. Hope the wait is worth it, and i also hope they mention something of it with next week's Forza monthly. It better be a dang good pack for the wait. Cloudy and Dsavage27 like this. I can’t wait to see the new main menu. I disliked the grey and angled presentation from the get go and never grew remotely fond of it. Hopefully car selection hasn’t been redesigned to resemble FH4’s small thumbnails in a grid. I actually don’t prefer that over the somewhat slower garage in FM7. adam thompson and TokoTurismo like this. Although it never bothered me in the past, I can see what you mean and agree that it was just...bluh. Hearing that it will get updated has me excited. I also read that it's going to be more faster for some menus(? ), like the Forza Drivers Cup for example. adam thompson and Nielsen like this. Interesting to note it's the presentation model and not the RLL/MTEK car that actually raced IMSA and WEC. I think the real big news here is the improved FFB that will now send tire loads to your wheel. I look forward to trying it tomorrow. DSR, NLxAROSA, CTstryk and 2 others like this. I wonder if they're still getting licensing/the intended cars together. Thats a heck of amount of time.They first announced there would be a second car pack way back in June I believe which tells me the car pack had to have been already done or nearly done by then. The only thing I can think of is that maybe they want to release it coincidence with some event or car reveal. My guess is either the new shelby gt500, the start of Imsa/WEC next month or some other car coming next year. It's weird either way. Full credit to the team there doing amazing job and I really enjoy playing Forza, can’t wait for update and hoping a I update sometime January or February would be cool. Anyway can’t wait and pretty happy about it plus the m8 is very nice too. Go turn10 keep it up. Also having Christmas holidays 1.5 weeks off soon so think I’ll knuckle down and finish up the endurance races for career mode. BoneSawTX and TokoTurismo like this. yabiggoose, girabyt3, TokoTurismo and 4 others like this. yabiggoose, AlienDeathRay, L8 Apex and 12 others like this. I was about to say the same thing Sir. Where is it? AlienDeathRay and Dsavage27 like this. I'd really like to know too. It's been so long since they confirmed it I'm starting to wonder if they even had one planned in the first place and now they're just falling behind trying to get cars for it. Saw someone say that the spotlight cars could have been part of a pack but they decided to release them for free instead. Wouldn't surprise me if that was the case. Forza Motorsport 7 introduces the world’s biggest car! NotThirdReich and J24681357 like this.